Kogod's Business Professionalism Course. Credit: Will Diamond. Last semester, Kogod hosted its first ever Business Professionalism course, a weekend workshop for undergraduates focused on fostering professional conduct in the workplace. 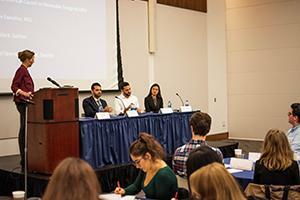 The two-day event – the second of which is scheduled for this spring – brought together Kogod sophmores for a series of business-focused panels, keynote discussions and presentations. The module was followed by a talk by Pete Metzger, Vice Chairman at DHR International, a teamwork panel and a closing speech by Gina Adams, Senior Vice President for Government Affairs at FedEx. Additional sessions, throughout Saturday and Sunday, included Teamwork and Leadership; Critical Thinking and Communication; and Growing your Career. In “Growing your Career,” led by Raina Ghandi, students learned the tips and tricks of the career building process. During the session, they played the role of the recruiter, giving them a tangible lesson on the importance of marketing oneself through resumes and coverletters. “My hope is that students better understand the value of demonstrating maturity and respect in the workplace. I also hope they use their non-verbal, presentation, and written communication skills to reflect a positive attitude and build a strong image in their professional environments,” Ghandi said. The event concluded on Sunday afternoon with keynote remarks from Mary Abbajay, president of Careerstone Group, LLC, and author Managing Up. Kogod’s next Business Professionalism course will be held Friday, April 5, 2019 from 5:30-9:30 p.m. and the following day, April 6, from 8:30-5 p.m.